There has been a lot of talk about redistricting here in Virginia lately. Virginia has eleven congressmen so the big question is, how should their districts be divided up? The first thing we should consider is how the districts looked prior to redistricting. These boundaries were drawn after the 2000 Census. Before we get started, I feel that I need to explain the word gerrymander. Dictionary.com defines the term as, “the dividing of a state, county, etc., into election districts so as to give one political party a majority in many districts while concentrating the voting strength of the other party into as few districts as possible.” In addition, districts should be compact and contiguous. So, with those thoughts, do you see any gerrymandering in our current map? I do. The first area I’d like to focus on is the northern portion of the 9th Congressional district. See anything odd here? For the most part, the 9th is pretty compact, containing all of southwest Virginia. But toward the northeast fringe, you notice it takes an odd shape to encompass the lower half of Alleghany County. This distortion is most pronounced when you also look at the 6th. Now what’s so special about the southern half of Alleghany County? I can find nothing about the county itself, but within this area is the city of Covington. Although the city of Covington is not a large place, the citizens typically vote far more Democratic than the surrounding areas. For example, according to the State Board of Elections in 2008 while 53% of Virginians voted for Barack Obama 55% of voters in Covington voted for him. Big deal you might say. It is only two percent. However, when we compare Covington to the surrounding localities, you do notice a significant difference. Obama only received 48% of the vote in Alleghany (surrounding the city), 43% of the vote in Bath County (to the north), 43% of the vote in Rockbridge County (to the east), 33% of the vote in Craig County (to the south), and 33% of the vote in Botetourt County (in the southeast). Of course many cities follow this trend. So why did they draw the lines to include Covington in the 9th? Well, until the last election, Rich Boucher, a Democrat, was the representative of the 9th. So, in order to improve his reelection chances as well as to move some Democratic voters out of the otherwise conservative 6th district, the bizarre looking lines were drawn this way. Now by themselves, the roughly 2,300 voters of Covington do not decide an election. However, when combined with other similarly Democratic localities spread over more than two hundred miles, they do make an impact. Even though Boucher lost in 2010 by about 9,000 votes, can you name at least one of the nine localities he won? Anyone? That’s right. Covington. The main purpose of gerrymandering is to benefit one or more parties (in this case the incumbents at the expense of other party challengers). Now that Boucher is gone, I hope the Covington enclave will disappear. 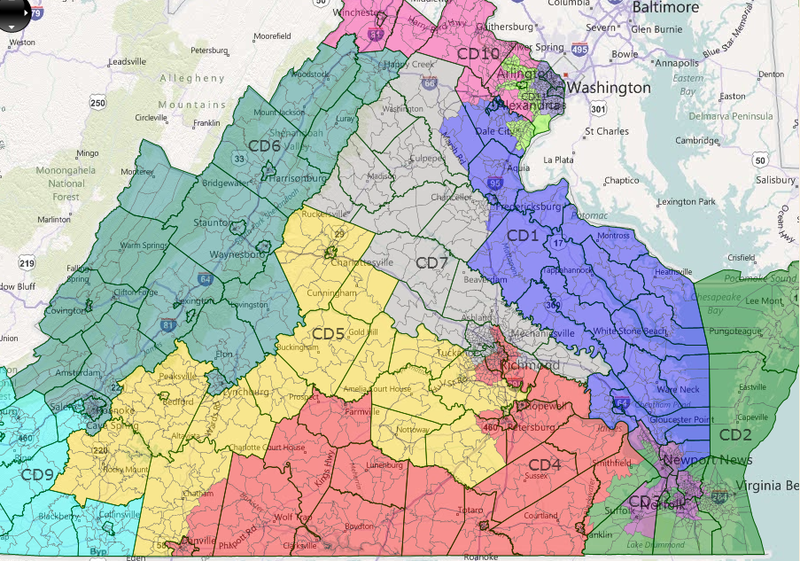 However, I can find no clearer example of gerrymandering in Virginia then the 3rd Congressional district. Look at this monster. Most of these localities don’t even share a common border unless you include the James River. Now maybe you could argue that communities along the James River share a common interest, but then why would you exclude the area in between Charles City County and Newport News in the north (James City County) and the area between Surry County and Portsmouth City (Isle of Wight County and Suffolk City)? You also miss a big chunk of the city of Newport News! Unfortunately, there is only one ugly answer; racism. Back in 1993, the Justice Department insisted that the state of Virginia create a Congressional district that encompasses a majority of minority citizens (in this case black people) with the presumption that these citizens would elect a representative of this race. Well, the plan worked and as of the 1993 election, that area has been represented by Rep. Bobby Scott. It makes no sense to me. In order to end discrimination we must discriminate? What if a district was created specifically to ensure a white representative? Would that not be equally as racist? What is the underlying message here? Racism is OK so long as it promotes the interest of some minority group? What a load of crap. This section of the Voting Rights Act has long since passed its useful purpose. Thank goodness President George W. Bush renewed the act in 2006. Good to see he had a strong grasp of federalism and the limited scope of federal power…oh wait. Moving on, in the last couple of days I’ve seen two maps circulating regarding potential redistricting plans both by David Wasserman of The Cook Political Report on his twitter feed. The first can also be found in an article by Shaun Kenney over at Bearing Drift. Please keep in mind that I am not trying to be critical of Wasserman as he is just offering hypothetical outcomes. Just a few comments about this plan. First of all, the 3rd is gerrymandered just as it has been. Now maybe, due to federal law, we have to have a racially mandated district, but I would certainly challenge that assertion in court. At the very least, put all of Newport News in the same district! Second, fortunately the whole Covington gerrymander issue has been resolved. Lastly, look at the 11th and the 5th Districts! The 11th is very ugly as it reaches around northern Virginia, picking up pockets of Democratic voters. Surely that district could be drawn in such a way that it makes gerrymandering look far less obvious. And then we have the 5th. Could this district be one of the most geographically elongated in the nation, going from the North Carolina border to one county away from Maryland? Have most people in Fauquier County ever been to Hailfax County, much less know where it is? You can’t honestly tell me that they share a whole lot of similar concerns. From what I hear, this plan mainly serves to enhance the reelection chances of all of the current Representatives. If each Rep. is secure in his district, what is the point of elections? In Soviet Russia elections were not contested. Do we want such a stagnant outcome here? For the handful of reasons listed above, the Virginia legislature must reject this map. Let’s look at the next map. This map assumes that the Department of Justice will require Virginia to create another majority minority district. In this case, it would be the 4th. As you can see, this new 4th would pickup a chunk of the city of Richmond and then stretch along the North Carolina border until reaching the city of Danville. Of course you could not draw a straight line from Richmond to Danville in this district as it excludes most of Chesterfield and Dinwiddie, both very strongly Republican areas. Actually, under this plan all you have to do is look at many of the areas in which Representative Forbes (the current legislator) did the best in 2010 (Powhatan 81%, Amelia 71%, half of Isle of Wight 69%, Chesterfield 64%, Nottoway 63%, Dinwiddie 61%, etc) and remove them from the district. Also, the 11th is just as ugly as it was before and now the 2nd looks horribly gerrymandered too as it wraps around the 3rd. I have to give this plan a failing grade as well. At the end of the day, it really shouldn’t be that hard. Although it may be nothing more than a idealistic dream, I really hope that the General Assembly will create non-gerrymandered compact districts based upon regional similarities and concerns. When you consider political parties, race, or protecting incumbent candidates, you really undermine the whole idea of free and fair elections in the first place. Maybe we should revert to how we briefly selected candidates back in 1933 where they were all elected at large. No threat of gerrymandering there. Heck, give me a map of Virginia, a pen, and the relevant census data and I’ll create a map for you that looks a whole lot better than any of the current proposals floating about or what we have now. Or maybe you’d prefer a few more bizarre districts like this one? It is like a Rorschach inkblot. What do I see? Deception, corruption, and maybe a set of sideways earmuffs. Ah, the fine art of gerrymandering! Career politicians, at what length will they go to ensure their reelection. What ever happen to the citizen legislators? Good article. Like the comment about Bush, turned out to be another rinho. Fred Hudson, 2nd Vice-Chair of the Virginia Democratic Party, discusses redistricting and gerrymandering on the locally-produced Charlottesville, VA, politics interview program Politics Matters with host and producer Jan Madeleine Paynter: http://bit.ly/pm-hudson. The current program features Bob Gibson, Executive Director of the University of Virginia’s Sorensen Institute for Political Leadership, discussing journalism and the media.